Pulling a thread is a method of straightening the end of a piece of fabric that has been cut raggedly or unevenly. Here's how to do it. 1. Snip through the selvage (the woven side) of the fabric near the end you want to straighten. 2. Work a single thread loose and pull it gently while holding the fabric. The fabric will gather up along the thread. 3. Keep working the gathers away from the end of the thread you are holding. A line will develop that you can see to cut along. 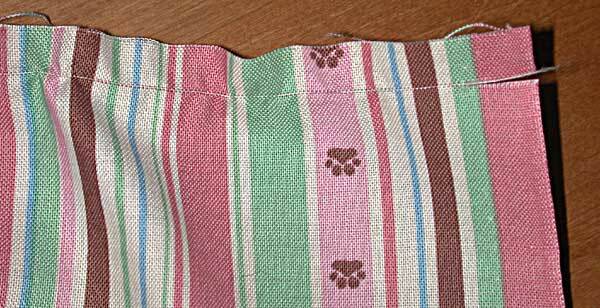 When the line extends all the way across the fabric, carefully cut along it. 4. If the thread breaks, cut along the line as far as it goes, then get a new thread and keep going until you have cut all the way across the fabric.